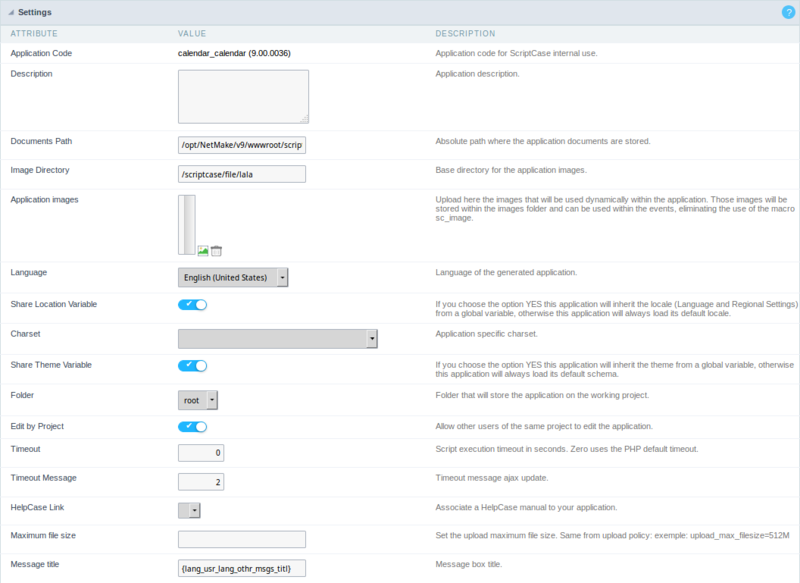 On this configuration, you can set the common attributes of the applications created by ScriptCase, you can view the attributes below. Application Code : Code of the application that is determined at the moment the creation of the application. This code can be renamed in List of Application. Documents Path : The absolute path of the application’s documents directory. Application images : Allows to import images into the application and use them within the application routines, disregarding the macro sc_image. Language : Language of the generated application. All the application’s hints and messages are displayed in the selected language. Use Share Location Variable : Shares the Location settings with other applications based on the value of the session variable. Maximum file size : Set the upload maximum file size of the application. Message title : Message box title. Error position : Position of the error messages on the application. Error Position on the field : The position of the error messages when criticizing the field. Show the Error Title in the Application : Show the title line of the error message in the application. Show the Error Title in the Field : Show the title line of the error message in the field. Script Error : Allows to display the information of the Script Line where a error occurred. SQL Error : Allows to display the SQL where a error occurred. Debug Mode : Runs the application in Debug mode, displaying the SQL statements at the moment that they are executed. Ajax Error Output : Enables the use of the ajax alert for debugging errors. Return After Inserting : Dont open a new blank record after an insert, instead go to edit mode. Exit Application : The target exit the application after processing the form. After accessing the function from the link “Synchronize table” you will see a comparison table between the application fields (left table) and the database table fields (right table), like the image above, the fields highlighted in “red” will be deleted of the application, the highlighted fields in “Green” will be inserted in the form, and the highlighted fields in “orange” will be updated, so data type will be updated.